ROSEMONT, IL, SEPTEMBER 24, 2018 -- Emerson today introduced its new SolaHD SDN 16-12-100C power supply to bring the benefits of the high performance SolaHD SDN-C Series power supply family to global applications requiring up to 16 Amp continuous 12 Vdc power. It is an excellent choice for system integrators looking for a full-featured power supply in a compact mechanical package with class-leading reliability. Designed for international use in harsh environments and hazardous locations, the new 12 Vdc power supply has all the same winning features as the legacy SDN 16-12-100P it replaces yet is 27% narrower to take up significantly less space on a DIN rail, plus it is competitively priced for maximum value. 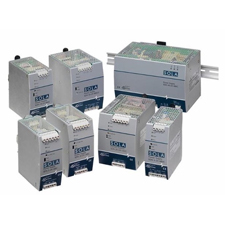 The SDN 16-12-100C power supply addresses the unique needs of factory automation, petrochemical processing, chemical plants, wastewater treatment, and material handling, among others. The SDN 16-12-100C power supply meets extensive international certifications including UL, CSA, CE, Class I Zone 2, ATEX, IECEx, ExEAC, ABS, and DNV-GL to ensure global compliance, even in hazardous locations and off shore applications. Advanced features incorporated into the unit, such as its wide operating temperature range, PowerBoost™ overload capability to start high inrush loads, universal AC and DC input voltage, and active power factor correction, provide the versatility required to power the vast majority of industrial loads. High reliability is a given with SolaHD power supplies and the new SDN 16-12-100C is no exception. Reliability comes in the form of a high MTBF, extensive diagnostics visually indicated by color LEDs, a relay output to provide power output status information to a PLC or other control equipment, and a potentiometer adjustable voltage output. For critical applications, two units of SDN 16-12-100C can be used in conjunction with the SDN 2X20RED Redundancy Module to provide redundant power supply operation. For more information, please visit www.emerson.com/en-us/automation/solahd.